SUMMARY: We present a patient with progressive dural calcifications, thickening, and enhancement presumably related to the development of nephrogenic systemic fibrosis (NSF). Head CT demonstrated progressive dural calcifications, whereas MR imaging demonstrated progressive dural thickening and enhancement during a 3-year period in which the patient received several gadolinium-enhanced MR imaging studies. To the best of our knowledge, dural calcifications are the only described intracranial finding of NSF. Nephrogenic systemic fibrosis (NSF), previously referred to as nephrogenic fibrosing dermopathy, is a relatively new, rare systemic condition first described in the literature in 2000.1 NSF occurs only in people with renal disease, with more than 215 documented cases in the NSF Registry at Yale University.2 All but a few of the known cases have been associated with intravenous administration of gadolinium-based contrast material.3 Manifestations of the disease are primarily cutaneous, but multiorgan system involvement has been described.4–7 Dural involvement has been described at autopsy; however, the depiction of the progressive imaging changes has not been documented.4,6,8 We report a patient with progressive dural calcification, thickening, and enhancement as a manifestation of NSF. A 52-year-old woman with a medical history of end stage renal disease secondary to adult polycystic kidney disease required hemodialysis starting in 2004. She had 8 gadolinium-enhanced MR imaging studies of the brain and abdomen between September 2004 and November 2006, all performed with gadodiamide. The initial brain MR imaging examination in September 2004 was performed for elevated serum prolactin levels. A pituitary microadenoma was seen, but results of the study were otherwise normal. A follow-up study in October 2005 demonstrated an interval decrease in adenoma size as well as new dural thickening and enhancement (Fig 1). 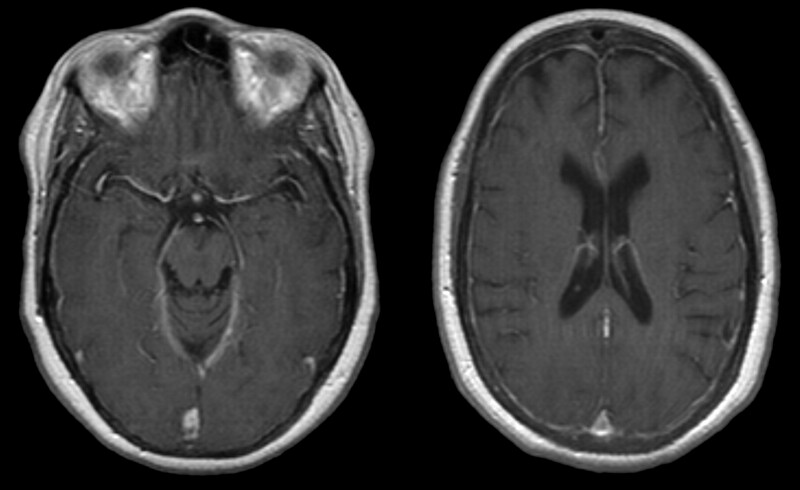 The dural thickening and enhancement progressed on the gadolinium-enhanced MR imaging study obtained in March 2006. October 2005. 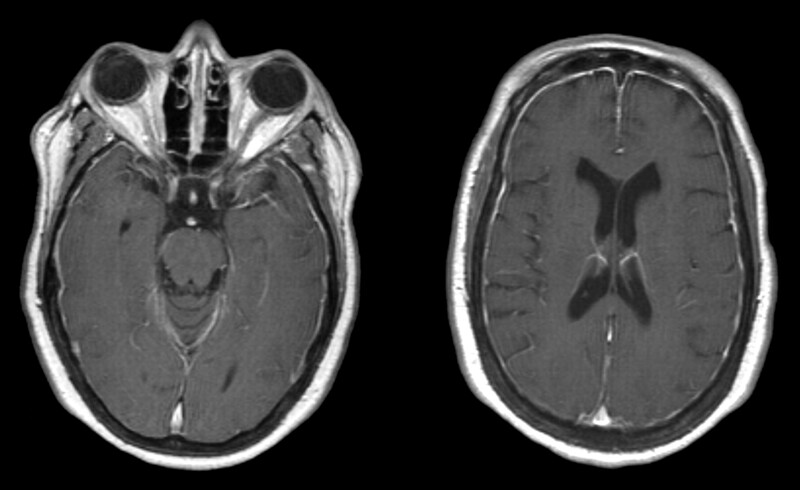 Axial T1-weighted postgadolinium MR imaging examination demonstrates diffuse dural enhancement. Changes in bone marrow are likely secondary to anemia. Because of the uncommon nature of the meningeal abnormalities, the patient had a right frontal craniotomy and dural biopsy in May 2006. The dura mater contained multiple areas of fibrosis and calcification with rare, multinucleated giant cells adjacent to the foci of calcification (Fig 2). May 2006. Section of dura mater from the right frontal lobe shows fibrosis and blue-staining area of calcification. A multinucleated giant cell (arrow) is in the area of fibrosis next to the focus of calcification (hematoxylin-eosin stain). 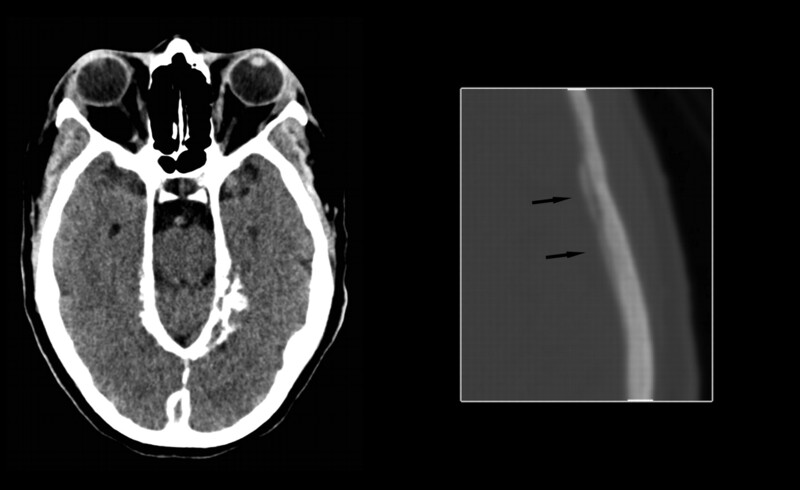 Head CT scan obtained in June 2006 demonstrated diffuse dural calcification (Fig 3). Follow-up gadolinium-enhanced MR imaging examination in November 2006 showed further progression of dural thickening and enhancement (Fig 4). 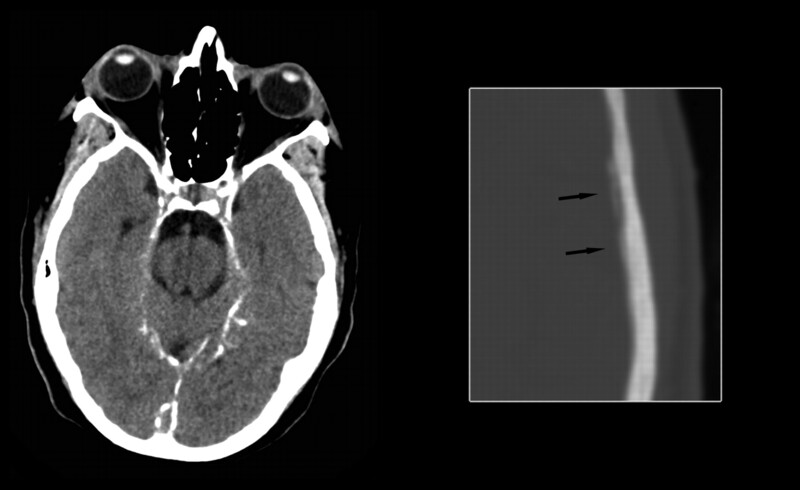 Head CT scan in March 2008 demonstrated progressive calcification (Fig 5). June 2006. Axial noncontrast CT image at the level of the tentorium in brain windows and magnified image at the level of the lateral ventricles in bone windows demonstrate diffuse dural calcification (arrows on magnified image). November 2006. Axial T1-weighted postgadolinium MR imaging examination demonstrates progressive thickening and enhancement of the dura. March 2008. Axial noncontrast CT image at the level of the tentorium in brain windows and magnified image at the level of the lateral ventricles in bone windows demonstrate progressive dural calcification (arrows on magnified image). In April 2007, the patient presented with progressive skin thickening and decreased range of motion of her hands during a 4-month period. Results of skin biopsy from the right palm revealed fibrocellular thickening of dermal collagen, patchy calcification of blood vessel walls and dermal collagen, and increased Alcian-blue–positive mucin staining consistent with NSF. Virtually all patients with endstage renal disease have resultant hyperparathyroidism, and “metastatic calcification” may develop, with calcium deposition in the soft tissues and dura mater. However, dural thickening and enhancement are not typically seen in these patients. The patient in this case report had serum calcium values within normal limits and did not have other foci of soft tissue calcification. Her serum phosphorus levels ranged from low to elevated but were predominantly within normal limits. 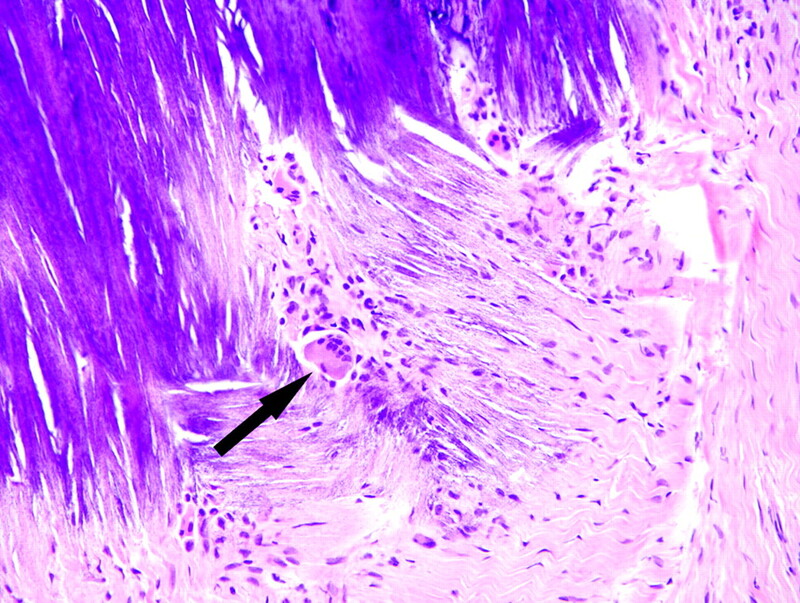 Although hyperparathyroidism cannot be excluded as the cause of the dural calcification because of the dural thickening and enhancement, the lack of other evidence of metastatic calcification, and her normal serum calcium levels, it is believed that the dural disease most likely represents a manifestation of NSF. We suggest that dural calcification, thickening, and enhancement in patients with renal disease and a history of exposure to gadolinium may represent an early manifestation of NSF. Neuroradiologists must recognize these findings as a part of the spectrum of disease in NSF and may be the first to suggest the diagnosis if these radiologic findings precede cutaneous manifestations.